You may never view your snapshots in the same way again. Rather than your family photographs being reduced to simple rectangles in a dusty old photo album, the new age of digital imaging is about to breathe new life into your favorite old photos. The technology that will change all this is embodied in a new Power Macintosh based kiosk called the Kodak Creation Station. 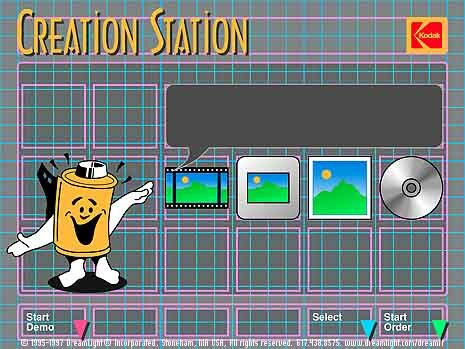 The Kodak Creation Station allows you to scan photographs from a variety of media including prints, slides, negatives and PhotoCDs directly into the system. You can do all sorts of neat things with the images once they are in the system. You can zoom, crop, rotate and adjust the colors of the photos. You can even add new elements such as backgrounds, borders, text and clip art to the images. You can use your photos to create greeting cards, business cards, flyers, reprints, enlargements, reductions and other fun items. The resulting modified images may then be output as new continuous tone prints or stored digitally on a new PhotoCD. This can all be done entirely within a self contained kiosk. When Kodak decided to bring this new technology to market they encountered a potential problem. Since the Creation Station was an entirely new type of high technology device, it might have seemed unapproachable to the typical consumer. What was needed was a fun and friendly way to make the device more approachable to users with no computer experience. They needed a self running demo that would be simple, informative and engaging. Kodak turned to DreamLight to produce the Creation Stations multimedia demo with a 3D animated character as tour guide. We design all artwork for a multimedia project in Macromedia FreeHand. You may be tempted to jump straight into a bitmapped program such as Adobe Photoshop. Unfortunately at this early stage of design, a bitmapped program is not nearly flexible enough for rough design work. We use FreeHand due to its exceptional object oriented design capabilities. This enables us to design multimedia screens using a custom grid much as you would use when designing pages for print. We can freely move and scale objects at will. Only when the design process is finished, do we rasterize the artwork for use on screen. We then bring the screen designs into Macromedia Director where we tie them all together into a rough mock up of the intended project. This is similar to creating a working pencil test reel in traditional animation where each scene is cut into the reel as they are completed. This way the client can get an early feel for the whole project much more accurately than they could if we had only used printed storyboards. 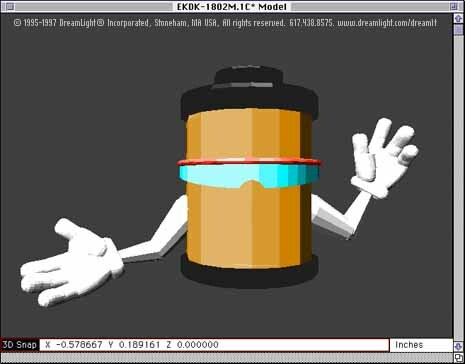 At the beginning of this project, Kodak already had a character that they were intending to use for the demo. It was a two dimensional character called Film Can Man. They were generally happy with the character but felt that it was a bit dated. We quickly persuaded Kodak to allow us to create a more modern 3D character to bring the project up to date. We designed a new character based on the film can idea. We gave the new character the qualities of an emcee and a magician, complete with a magical cane. Since the arms and legs dont significantly add to a characters expressions, we simply allow the hands and feet to float freely. Unfortunately, Flip was too radical a departure from Kodaks initial idea of the Film Can Man. So, working closely with Kodak, we moved back toward the original Film Can Man with a new 3D version of the character called Snapshot. We built the model of Snapshot in Macromodel, the precursor to Macromedia Extreme 3D. Today we build most of our models in Form-Z or Lightwave 3D. Notice the simple construction of the model. The only moving parts are the arms and hands. The face is created by applying an animated texture map directly to the film can itself. 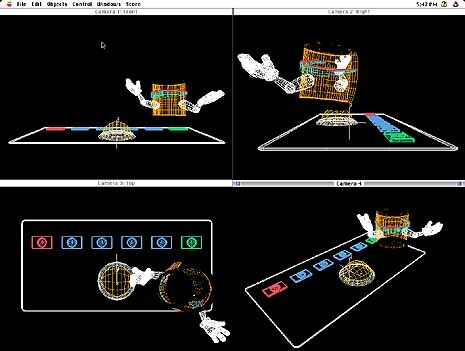 This enabled enormous flexibility to change the facial expressions independently of the model or the scene. We drew the facial animation in Macromedia FreeHand. FreeHands interactive blend feature enables us to adjust the blend as much as we like and it automatically rebuilds the blend. This enables us to create just the motion we are looking for. Once the models are built and the textures are animated we assembled the scenes in Macromedia Three-D, the precursor to Macromedia Extreme 3D. Today we use Lightwave 3D, Electric Image Animation System and Strata Studio Pro for 3D rendering and animation. The rendered frames are then brought into Macromedia Director for final assembly. By holding most of the frame still, we can animate a very small rectangle. This way the computer doesnt have to labor very much to play back the animation enabling us to run the demo on a wide range of computer kiosks. This also allowed us to fit the entire demo into the allotted disk space of 10 megabytes. When the kiosk is not being used, this Welcome Animation runs as a continuous loop. It is designed to attract the attention of consumers and provide them with a glimpse of the Creation Stations capabilities. When a consumer approaches the kiosk and presses the demo button they are presented with the Multimedia Demo. The demo is hosted by the 3D animated character, Snapshot. Snapshot takes the consumer on a brief guided tour of the Creation Stations capabilities.